A grammar school has failed an Ofsted inspection - the first time this has happened to such a school in England. Stretford Grammar School, Manchester, was placed in special measures after inspectors decided its overall effectiveness was "inadequate". Inspectors found there were weaknesses in the school's management and a lack of high grades in maths and science. The local authority, Trafford, says there were enough positive aspects to give "encouragement for the future". The school is in the constituency of Children's Minister Beverley Hughes, who said it was "the first grammar school in the country to go into special measures". She said: "This is a shocking indictment of the management of this grammar school". She accused the local Conservative council leadership of trying to "brush under the carpet" the problems with this grammar school. There are 164 grammar schools remaining in England - many among the most academically successful in the country. Last year, Stretford Grammar scored 92% in the proportion of pupils reaching the benchmark of five good GCSEs including English and maths - almost double the national average of 47%. But the inspectors' report on the school contains a series of criticisms, including a lack of adequate leadership and a lack of progress among girls. Even though this is a grammar school, the report found that higher ability pupils were making only "very slow progress". 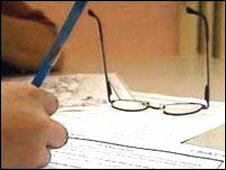 Teaching was satisfactory with "pockets of good practice", the report said, praising English, music and drama. "However, too much teaching remains lacklustre and is not good enough to ensure that all students achieve as well as they should," it added. "The overall effectiveness of the school has declined since the last inspection and is now inadequate," it concluded. The report highlights the challenges facing the school - saying that it serves an area with high levels of disadvantage and that 30% of its pupils speak English as a second language. Two thirds of the pupils at the school are from an ethnic minority - and the report notes there is a high proportion of boys there. The school had also suffered from a decline in numbers, which the report says has put pressure on its budget. Trafford's director of children and young people's service, Chris Pratt, said that alongside the criticisms there were positive signs. "These include the good personal development and well-being of pupils, the positive attitudes found among students, good attendance and behaviour, the feeling of safety and security in the school, positive pupil/teacher relationships, high staff morale and the good teaching and learning in the sixth form. "All of this gives significant encouragement for the future." The school currently has an acting head teacher, David Wilson, who is also head teacher at Sale Grammar School. The teacher in the permanent post has resigned after being on long-term sick leave. Mr Pratt said parents at the school had been informed of the situation and would receive a copy of the final Ofsted report. Schools in special measures will have to show that they have made improvements - or else face the threat of closure. There have been no closures of grammar schools, or removal of selective status, since Labour came into office in 1997.